When Kim Lamarre of Quebec City stepped on the podium to collect her Olympic bronze medal in slopestyle skiing in Sochi, it capped a remarkable comeback for her. Having missed the 2012 and 2013 season due to injuries, Kim was dropped from the Canadian team prior to the 2014 season. The result? She had to raise her own funds to be able to qualify and travel to Sochi. Aside from selling sponsorships, Kim turned to crowdfunding to help raise the funds she needed, and her campaign on RallyMe.com has raised more than $7,000. Kim wasn’t the only Canadian athlete using crowdfunding to fund her Olympic dream. Larisa Yurkiw (alpine skiing), Alexandra Duckworth (snowboarding), Megan Imrie (biathlon) and Molly Milligan (snowboarding) all raised money through crowdfunding. Internationally, the Jamaican bobsleigh team raised more than $100,000 on Crowdtilt and US speedskater Emily Scott raised $60,000 on GoFundMe.com to help prepare and travel to Sochi. The reason crowdfunding works for so many athletes is that it gives supporters and fans a tangible way to engage with the athlete. Money donated goes directly toward supporting the athlete’s Olympic journey. Similarly, crowdfunding continues to grow in popularity among startups looking to fund their business. Startups use crowdfunding to raise small amounts of capital contributed by a large number of donors to support the financing of a new venture. obtain feedback from its most interested customers. MaRS clients BublCam, PUSH and Revelo LIFEbike recently completed successful pre-sales crowdfunding campaigns on Kickstarter and Indiegogo respectively. Want to learn more? Our latest article, Crowfunding campaigns for startup funding: What you should know, offers some key insights for entrepreneurs interested in the funding model. But for all those benefits, crowdfunding should not be thought of as “easy money.” Stories about failed campaigns have become plentiful. While accurate data is hard to come by, it is clear that the majority of crowdfunding campaigns fail to meet their funding target. Considering crowdfunding for your startup? Read our new article on the top risks of crowdfunding to better understand what can go wrong. Crowdfunding is a young industry and best practices are still emerging. At MaRS, we continue to monitor the evolution of crowdfunding and the many ways it can help technology entrepreneurs. 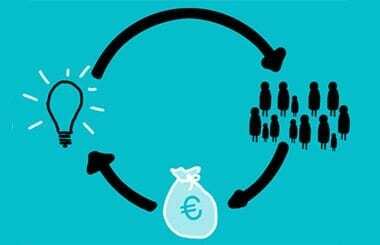 Crowdfunding: Is it right for your startup?